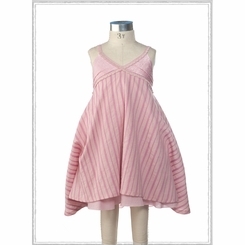 Beautiful casual Spring dress with ruching and subtle stripe detail. Perfectly formed with cross over triangle chest and full style skirt. Tie the sides up for a vintage bustled look or leave the sides untied for a more relaxed look. Made in the USA.